We are very delighted to announce the permanent exhibition of the Social Media Art Gallery in the event rooms of the design hotel 25hours in Hamburg Hafencity. Whenever you are in Hamburg and like to view online art in the real world, feel free to contact us for a private view. Either you are one, two, three or a bunch of people, we welcome you in the beautiful harbour region of Hamburg and the curator in person walks & talks you through the gallery – for free. Additional to the free art walk with the curator, we can organize for you a refreshment before or after the gallery visit in one of the restaurants of the 25hours hotel which securely, is also a great experience. Simple booking by emailing us with required dates, time and size of group. Meanwhile, have a little art preview online in our gallery and meet you soon offline. Meet Rusty Wiles in the Big Apple! The next Meet & Greet with a Social Media Artist is coming up. 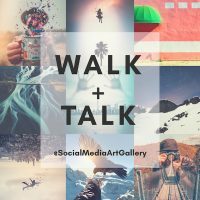 Take the special opportunity and meet Rusty Wiles aka @rustyfd912 face to face in Manhattan in the Social Media Art Gallery at the Affordable Art Fair.